Megan and Liz are YouTube sensations and have proven they are here to stay. The girls stopped by SheKnows to talk about what they are looking forward to in the future. Megan and Liz didn’t rise to fame in the normal way — or maybe the way they did it is the new normal. The fraternal twin sisters got their start on YouTube. All the way back in 2007, they posted video after video and gained new fans each time. The sisters have more than a million subscribers on YouTube and are touring and hanging out with musicians they have idolized for years. Megan and Liz stopped by the SheKnows studios to talk about their lives, their new music and what they are looking forward to in the future. The girls were asked by a fan if they knew, like most girls, what their dream weddings would look like. As for Liz, she had a different idea about how to answer the question. The twins are now all grown up and are finding out who they are. Growing up without a father affected them in many ways, but they are happy with who they have become. 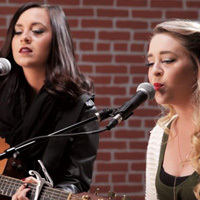 Megan and Liz also performed for SheKnows and shared details on their new album.